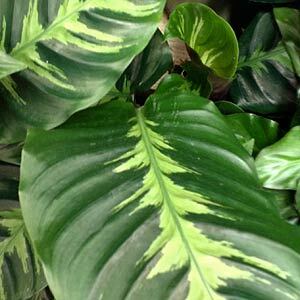 Calathea are widely used as a foliage plant with a number of varieties being available for sale from wholesale growers. Grown for the large ovate leaves which display wonderful color and texture, they are widely used as indoor plants. With Calathea Zebrina being one of the more popular species offered by wholesalers, the whole genus is sometimes called ‘Zebra Plants’, however a number of different forms are available with different characteristics. They are amongst the most attractive group of tropical indoor plants for foliage. Many different patterns and leaf textures make them a standout. With proper care they are a fairly easy to grow plant and are widely used in offices and other indoor commercial landscaping projects. Humidity and temperature are the main factors of concern. Caltahea zebrina is the most widely grown species however others are also available and used in hybridisation. They do flower, however the flowers are rather inconspicuous, foliage is the main attraction. Calathea insignis (syn C.lancifolia) has variegated sword like foliage with red backing to the leaves. Calathea rufibara has green foliage, undulating at the margins and good red stems. Calathea roseopicta has heavily patterned leaves, pale and deep green variegation with deeper green margins. Needing warmer climates to grow outdoors, they do make an excellent indoor plant and are sold in all states.